Now, let's talk about what's right. First, the finish on this 1969 Roadrunner Convertible�it's stunning! Beautifully applied, the turquoise paint simply sparkles in the sun. The stainless trim is all buffed and shiny, the bumpers and window frames are re-chromed, the grille and taillights are new, all of the lenses are clear and the glass is excellent. Proper textured paint coats the hood and looks great. A new top goes up and down as new, everything electrical lights up and the new horn cheerily announces itself with a "Beep! Beep!" 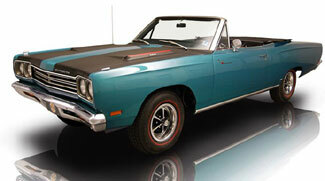 Lift the hood of this 1969 Plymouth Roadrunner Convertible to show off the highly detailed, original 383 engine. Underneath the proper molded hood pad you'll find a new unsilenced air cleaner with a new pie pan, fresh orange paint, correct exhaust manifolds, date coded wires, new hoses, a new red top group 27 battery and a reproduction coil. You'll also find the correct 053 22" radiator, as fresh and detailed as the rest of the compartment. A remanufactured wiper motor and brake assembly take hold of the firewall, anchored with new wiring and new ignition components. Power flows from the engine into the numbers matching transmission, the original driveshaft and the original rear. It all works well, and being original it makes sure your investment is safe! Underneath, you'll find clean sheet metal that's been blasted clean of its undercoating and freshly draped in satin dark gray paint. The new exhaust system connects to the stock manifolds and heads underneath to a high flow X pipe and Flowmasters before ending up stock looking out back. The front suspension and all brakes have been rebuilt, there are all new lines and a new tank and strap set. The car's nice and tight, sounds awesome and rides great!